Lancaster Products K1-Lab Mixer: A new dimension to your mixing and pelletizing process. The Lancaster Products K1-Lab Mixer is our flagship product used for testing, experimentation, and development of new processes and products. An economical and rugged machine, the K1-Lab Mixer can also be used for small production work. The K1-Lab Mixers have repeatedly proven to be a minimal investment with maximum dividends in product development. Large viewing port on the pan cover for adding process materials, observing the mix, and taking samples during the mixing process. The K-1 Lab Mixer not only provides value during proof of concept testing but throughout the entire product development and production process. Scaling up to production sized volumes is seamless as the Lancaster K3-10 Series mixers operate with the same counter-current high shear mixing action as the K-1 Lab mixer. This allows for efficient transfer of process specifications requiring only minimal adjustments to the mix design. In addition, the K-1 Lab Mixer facilitates the ability to optimize formulations and experiment in smaller batches, without having to disrupt production for development work or waste large amounts of material from experimenting in a K4-K10 sized mixer. 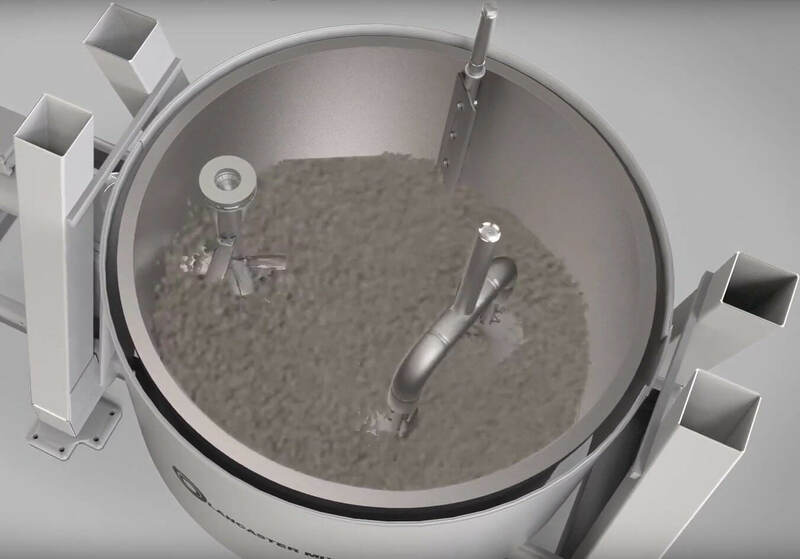 The K1-Lab Mixer has the same counter-current mixing design as all Lancaster Mixers with the clockwise rotating pan bringing material into the counterclockwise high speed rotor. The rotor and pan speed are infinitely variable. This mixing design provides not only improved mix quality but can pelletize in one process step. In addition, processing times can be greatly reduced while providing a more homogeneous batch. These features, combined with the rugged construction and the various styles of rotors available, make the Lancaster K1-Lab the mixer of choice for almost any type of batch mixing. The K1-Lab Mixer is designed with a touch screen control for easy programming and data viewing. A thermal probe gives a report of temperature in real-time. There is a resettable elapsed mixing timer that provides for total mix process cycle times. A pre-programmable mix design can be input into the control. The control can also store and repeat mix cycles as well as communicate with other devices. Electronic individually controlled speeds of pan and rotor, switchable from ft/sec to m/sec. Timer that starts/stops with the machine. Pan heating and cooling available. The K-1 Lab Mixer has the same counter-current mixing design as all Lancaster Mixers which provides improved mix quality and can pelletize in one step. Lancaster Products also provides full-scale lab services – from proof of concept testing to large-scale toll processing – as well as equipment rental units allowing customers to try equipment in their own facilities over a period of time.